This February, I decided to join my fellow TAYers (?) in doing the “Four in February” challenge, in which we try to beat four different games over the 28, or occasionally 29, days of that shortest month filled with romance, Mardi Gras, and fish frys. I did not expect to beat all of the games I was going to this month, and I very nearly didn’t. For the first half of the month, I was spending about 12 hours at school each day due to rehearsals for a musical, and the week running up to the performances had almost no gaming, aside from Mario Kart 8 Deluxe backstage when we weren’t on. While I did beat all four games in February, I only actually started one of them this month. I’d begun Layton’s Mystery Journey about a week or two into January of 2018, having played about four hours of it on 3DS. I absolutely adore most of the previous entries from the Professor Layton franchise, and I wanted to see where the series went next. It turned out that most of my apprehensions were vindicated. I love Katrielle and her quirky friends, and while the art and music were strong, if not amazing, the things that I came to love the series for, the story and puzzles, were among the weakest in the series. Instead of having one overarching mystery with different locations, twists, and turns, there is a series of 12 cases for Katrielle and co. to solve. While they are well-written and full of cute little stories, I longed for the emotionally gut-wrenching stories the series is known for. The final case scratched that itch a little, but it felt incredibly rushed, seeing as it took place over two hours as opposed to 20. Likewise, the best puzzles were saved for last, but the majority of them were uninspired and often obtuse. There were some gems thrown in, but the standard of quality has noticeably dropped since the passing of the previous puzzle-master, Akira Tago. In total, the game took about 25 hours to beat. I didn’t mess around with the mini-games or extra puzzles, as I really just wanted to get to the end and move on. I don’t regret my time with the game, as it was enjoyable enough to relax with for a half hour here and there, but I was ultimately happy to be done with it. I think that the series changing to an anime could be a good change for a while, because I love the art style of the cutscenes, and an episodic would be very good for what they’re aiming for. I had played about 10 hours of The Last of Us between August and September, but I was sadly distracted by other games and hadn’t come back to it. And I am so glad that I came back to it, because holy crap this game is amazing!!! I don’t know why The Last of Us didn’t click (no pun intended) with me the first time I played it. The traumatic opening aside, the game does take a while to ramp up, and if you’re me, it starts out really slow. I hadn’t ever played a shooter before, aside from Splatoon, and my horrible aim combined with my misguided belief for the longest time that I had to kill everything in the room (including clickers!) really slowed down the game. When I started again, I was in the sewers, and I remembered one moment when I had been separated from the group to find a generator or something. I heard bad zombie sounds from behind a door, and I thought to myself, “you know, how much do I really need to see what’s behind that door?” I completely ignored it, and I probably had a better time because of it. For some reason, coming back to the game, I was a lot smarter than I had been before. I actually used my molotovs and bombs. I thought strategically about upgrading my skill tree and guns. And I killed as few people and zombies as possible. It also helped my experience that the latter half of the game gets freaky, and I was down for every second of it. There were a few parts where my breathing would slow down, wanting yet not wanting to know what happens next to these characters I had developed such a close emotional bond to. Overall, the game took me about 22 hours to beat. I died a lot and liked to explore a bunch when I could, which likely contributed to the game being longer for me than advertised. And also, yeah, killing everything in the beginning meant that the game crawled at a snail’s pace to begin with. I am unbelievably hyped for The Last of Us Part II. For Nintendo games, I pretty much have to watch all of the trailers and coverage to stay in the loop, but I’m planning on going into this game as blind as possible. The first game’s already sold me on it, so I don’t need to see any trailers. This was the biggest surprise of this month. I was planning on playing through Fire Emblem Warriors, but I ended up really hating the game from the onset. Luckily, I got my first review code in from KeenGamer! I was at school when the code came in, and I was so eager to play it that I tethered the Switch to my phone’s hotspot so I could download it, since my school blocks WiFi to gaming devices. The rest of Friday and Saturday were spent playing the game, I spent six hours writing the rough draft on Sunday, and I had the article cleaned up and ready to be published by Tuesday. If you want my full opinion, you can read my review here, but the gist is that it’s vaguely similar to the structure of The Legend of Zelda, but focused on verticality due to Otus, the main character’s, ability to fly anywhere. There are many tears and laughs along the way, and it features some of the most gorgeous pixel art I’ve ever seen. I highly recommend it on either PC or Switch, and both PS4 and XB1 versions are coming sometime this year. It took me about 12 hours to beat, although it would have taken me 10 if I hadn’t wasted so much time on one evil little mini-game. This was the first game I played on PS4, and tragically got buried by an avalanche of other games after 20 hours, starting with The Last of Us. That’s an absolute shame, because Horizon: Zero Dawn is now retroactively part of my top three games of 2017. You’ve either played this game, or you’ve heard about it: It’s one of the most gorgeous PS4 games out there. It has a riveting Sci-Fi story. Fighting the machines is the most satisfying and visceral experience I’ve had with a game in a long while. The supporting characters are mostly lovable and both written and performed like actual human beings. And Ashly Burch kills it as Alloy! And then there’s the soundtrack, and the Cauldrons, and the way the sun is reflected in the water in the morning and AHHHHH THIS GAME IS SO AMAZING! ...Ahem. 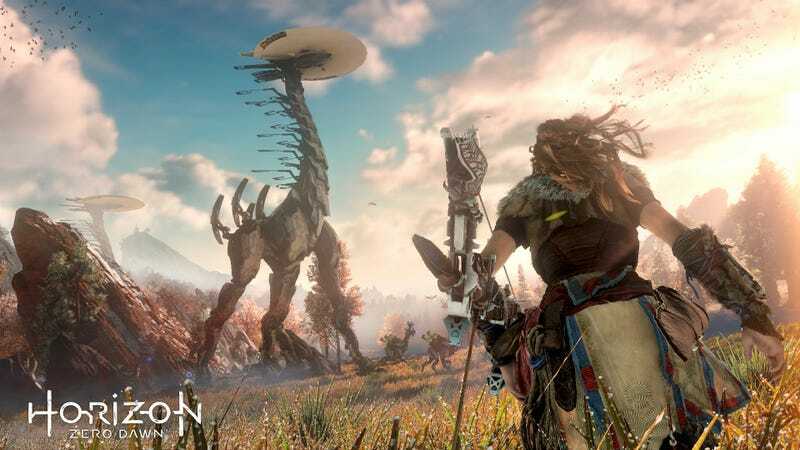 Horizon: Zero Dawn is the best game I had the pleasure of beating this February, and I will absolutely be back to play through The Frozen Wilds and to complete the rest of the game. Clocking in at 45 hours, and beating it literally three hours before the end of February, I cut it close, but Horizon: Zero Dawn marked my completion of the Four in February challenge! I am so glad that I took the time to go through these games. In fact, it wouldn’t be a bad idea to have a list of games that I want to beat for each month of the year. It’s not set in stone, but I’d like to spend March playing through the New game + of Xenoblade Chronicles 2, at least the first ending of Nier: Automata, maybe Uncharted: Drake’s Fortune, and then spend my Spring break playing through as much Persona 5 as possible. I’m probably not going to go into it with as much commitment as I did with the February event, but it’s nice to have a general roadmap for the near future. What games did you play this month, and what are you planning on playing in March? Say something in the comments below!